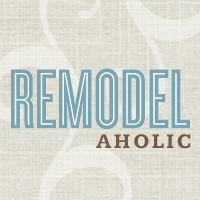 Remodelaholic | Kitchen Remodel on the Cheap! After looking at this picture a bit, we’ve decided to break out our tools again and carry the subway tile back between the stove and microwave. Just need the motivation! UPDATE! We tore out some tile and continued it behind the stove. Bright and Blue and Beautiful; Kitchen Remodel!